600kcal portion of a great dish. 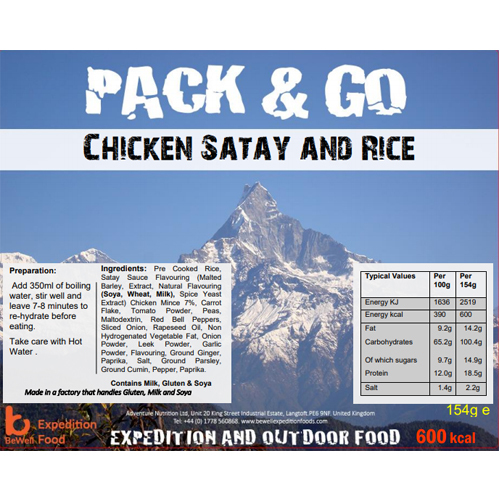 Satay Sauce Flavouring ( Malted Barley, Extract, Natural, Flavouring (Soya Wheat, Milk), Spice Yeast Extract) Chicken Mince 7%, Carrot Flake, Tomato Powder, Peas, Maltdextin, Red Bell Peppers, Peas, Maltdexin, Red Bell Peppers, Sliced Onion, Rapeseed Oil, Non Hydrogenated Vegetable Fat, Onion Powder, Leak Powder, Garlic Powder, Flavouring, Ground Ginger, Paprika, Salt, Groun, Parsley, Ground Cumin, Pepper, Paprika. Contains Milk and Soya & Gluten.